One of my favorite rooms in my house is my little laundry room. 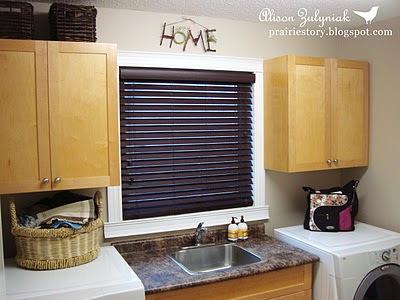 It's actually multipurpose being the mudroom off our garage as well. Needless to say it gets a lot of use. Fortunately, I have some decent storage to keep things accessible, yet out of the way with the cabinets above the washer and dryer. I use every shelf and square inch of space. I also use the top surface of the washer to hold a small laundry basket to collect kitchen cloths and miscellaneous items that need washing. I usually have my purse or diaper bag on the dryer, packed and ready to go! Washer Cabinet: Top Shelf - Ziploc bags store household items such as felts for furniture legs, child proofing stuff, etc. I also keep shoe polish and leather protectors up top because we use them, but not frequently enough to warrant being on a lower shelf. Middle Shelf - Sewing kit, a mason jar to store buttons, and GladWare holding the abundant of batteries that we seemingly need to have on hand to operate gadgets and kid's toys. 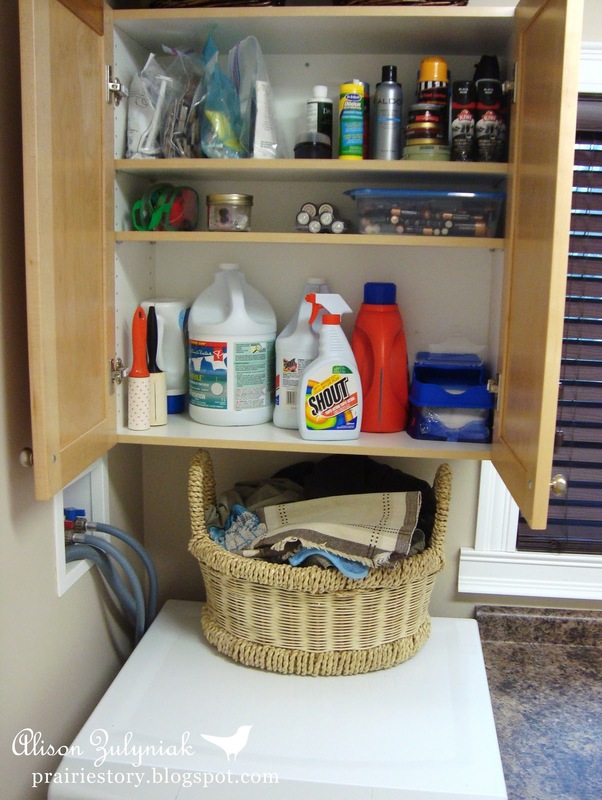 Bottom Shelf - All the detergents, stain removers, fabric softeners and bleach for the washing machine! 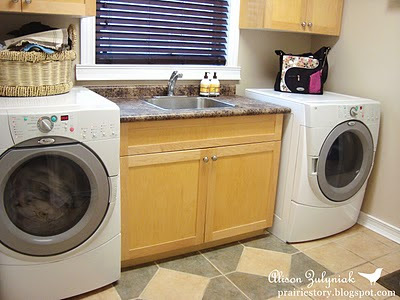 Dryer Cabinet: Top Shelf - Lights bulbs, light bulbs, and light bulbs. Again, we use them, but not frequently enough to warrant being on a lower shelf. Middle Shelf - Miscellaneous cleaning and dusting supplies. 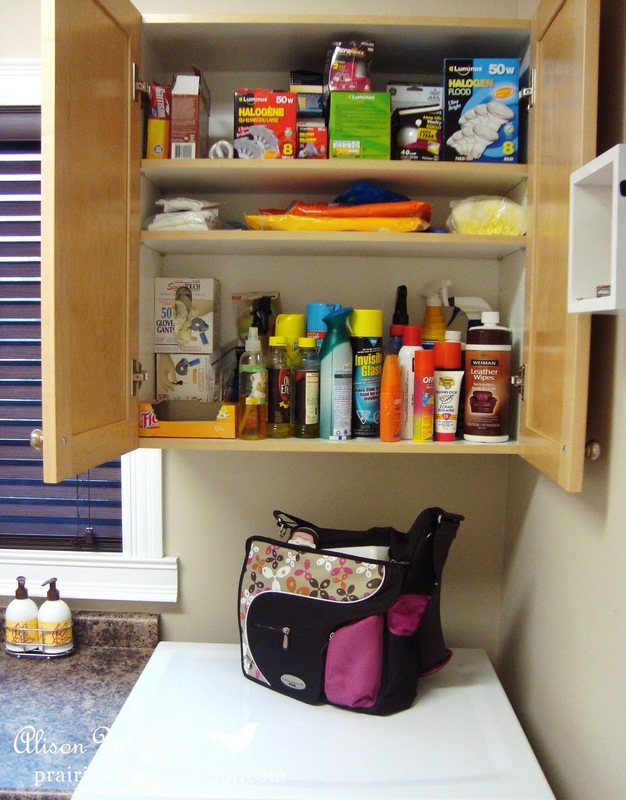 Bottom Shelf - Dryer sheets, cleaning supplies, sunblock and bug spray. Now back to doing laundry! That's awesome! I really need to organize my laundry supplies but right now I guess they'd better wait in line, lol! 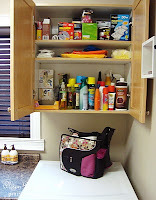 It's time to reorganize the "big" pantry first. My laundry room is so tiny. I would love to have a sink in my laundry room! I am visiting from a bowl full of lemons. My question is, why do you have the machines separated by a counter and sink? I have never used my machines separated but I have also never had the option to have them any other way. I don't mind doing laundry but I would like eventually have a space where the laundry flows better than it does now. Thank you for your post and for answering my question! our laundry room is also such well maintained and my mom is so satisfied with the appliances there.